Embroidery pour le Jardinier presents over one hundred designs by Sylvia Blondeau, a French artist who specializes in craft and illustration. The designs are simple, modern, and suitable for a wide range of projects, while reflecting an interest in gardening and the out of doors. Both beginners and experts can expect to find many charming motifs to incorporate into their projects big or small. The designs range from a simple flower to a complex scene with multiple characters and devices. Especially delightful are the various trees with flowers or fruit, animals like a fawn, squirrel, or owl, and vegetables and flowers. Tools and garden equipment, you ask? Yes, they are there too: a wheel barrow, clippers, spritzer and more. Adorable young women appear throughout the book engaged in many activities from walking a dog, to watering a garden, and dipping a toe into cool water. The motifs are very adaptable and can be applied to many different projects and parts can be swapped with other motifs. Each two page spread of the finish project is followed by a detailed spread of diagrams giving the stitches and DMC colors. End pages give general directions for embroidery, detailed directions for individual stitches used in the book, and directions for making over a dozen projects. A useful and charming addition to the craft library of anyone who likes the gifts of nature. 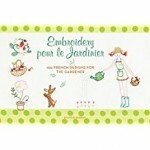 To buy Embroidery pour le Jardinier from Amazon.com Click Here.